Panoramic Ocean View! Amazing Sunsets! Whale Watching! You've found 'The Hideaway at Beverly Beach'. 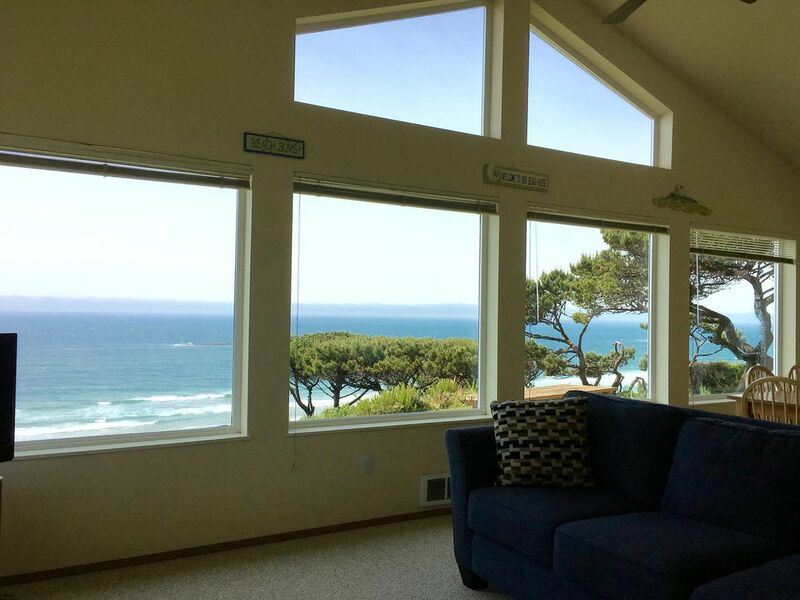 Experience the beauty and marvel at the sweeping ocean view. Located in a small neighborhood just north of Newport. It is a short walk down the hill to beautiful Beverly Beach. Watch amazing sunsets from the comfort of our living room. Enjoy the peace and quiet, and relax. Fully furnished with everything you will need, we know you will enjoy your stay at our home-away-from-home and the many things the Newport area has to offer. Create wonderful memories at The Hideaway At Beverly Beach. Book your stay today. All major credit cards accepted. 1 King Bed, 2 Queen Beds, Free Wi-Fi, High Speed Internet, 49” Samsung Smart TV with Netflix, Hulu, Amazon Video and much more. LG 2.1 300 watt Wireless Sound Bar with SubWoofer and Bluetooth, Sony DVD Player, CD Player Radio Boom Box, Full Kitchen, Microwave, Dishwasher, Refrigerator, Cooking Utensils Provided, Washer-Dryer, Large Gas Grill. Home is fully furnished. It is private with a big yard and view is truly stunning! Small private community but only 10 minutes from the hustle and bustle of Newport! Access to Beverly Beach is just down the hill from the house at Beverly Beach State park. A 10 min walk or minute and a half drive. We usually drive down. The beach is right there! From the bluff you can see the beach stretching South 5 miles to Yaquina Head Lighthouse! As far as the eye can see North, Sound and West! We have a large private yard. The Hideaway at Beverly Beach is 6 Miles North of Newport Oregon and 1 Mile South of Cape Foulweather.